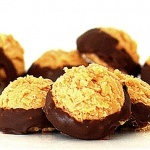 December 16th is #NationalChocolateCoveredAnythingDay. I’m not sure how that came to be a national food holiday, but who am I to complain about anything chocolate? 😉 So in the spirit of this “holiday” tradition, how about giving these super easy Vegan Buckeye Balls a try? I used the classic peanut butter version to make ours, but why not great creative with your favorite nut butter. You can even use a crunchy nut butter for a little bit of texture. The dairy free chocolate chips are found everywhere these days. I buy the chips from the Enjoy Life brand. I used a small cookie scoop to form the balls rather than rolling them smooth. I actually prefer the way they looked this way. Once formed, they are dipped into melted chocolate and allowed to firm up in the fridge. In the bowl of an electric mixer, combine the margarine, sugar and vanilla. Add the peanut butter and blend until smooth. Using a small cookie scoop, portion onto a cookie sheet. I like to roll them and then place into the freezer for 20 minutes to firm them up before dipping into chocolate. Melt the chocolate in the microwave on full power with 1 tsp of vegetable shortening in 30 second intervals. Stir frequently. You could also create a double boiler by bringing a pan of water to a simmer on the stove and placing a glass bowl over top. The water should not touch the bottom of the bowl at all. Stir continually to prevent scorching.